Scott Van Pelt - ESPN Press Room U.S.
Scott Van Pelt is host of the midnight edition of SportsCenter, bringing his unique perspective to the world of sports since September 7, 2015. The program showcases Van Pelt’s passion for sports, with his self-deprecating wit and disposition toward celebrating stars and storylines. In addition, Van Pelt contributes to ESPN’s telecasts of the Masters and The Open, two of professional golf’s majors, as both an anchor and hole announcer. He also hosts SportsCenter reports and specials from the events. Van Pelt joined ESPN in early 2001 as the network’s lead professional golf reporter, shortly thereafter becoming a SportsCenter anchor and later a co-host on ESPN Radio of Tirico and Van Pelt each weekday afternoon.. 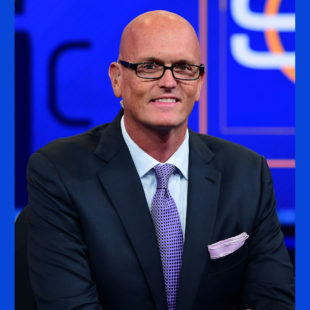 In July 2009, The Scott Van Pelt Show made its debut on ESPN Radio and in a simulcast on ESPN2. The show was re-named SVP & Russillo in October 2012, and ended in the summer of 2015 when Van Pelt was preparing for the launch of the new midnight SportsCenter. Van Pelt also contributed to ESPN College GameDay for several years with his “Bald Man on Campus” feature. Van Pelt came to ESPN from The Golf Channel, where he was an anchor and reporter for the sport-specific network from 1994-2000. During his years there, he was the co-host of studio programs Golf Central, Leaderboard Report and occasional host of Viewer’s Forum. Van Pelt began his sports broadcasting career at WTTG-TV (FOX) in Washington, D.C., in 1990. He worked in WTTG sports studio production department contributing content for the station’s The 10:00 News, Sunday Night’s Sports Extra and specials on the Washington Redskins. A native of Brookville, Md., Van Pelt graduated from the University of Maryland with a bachelor’s degree in radio/television and film. He is proud of his Maryland Terrapins sports teams and often attends games as a spectator when his schedule permits.